First, let me state for the record that I used to say that oven baked French Fries are about as appetizing as a cooked Gila Monster…YUCK! Until I tried these! I can’t even remember where I got this recipe from so I can’t give the credit to the rightful person. Whoever you are, thank you big time. I grew up in Idaho and since I was old enough to exchange breast milk for spuds, I’ve been eating these things with gusto. I consider myself a true spud connoisseur. 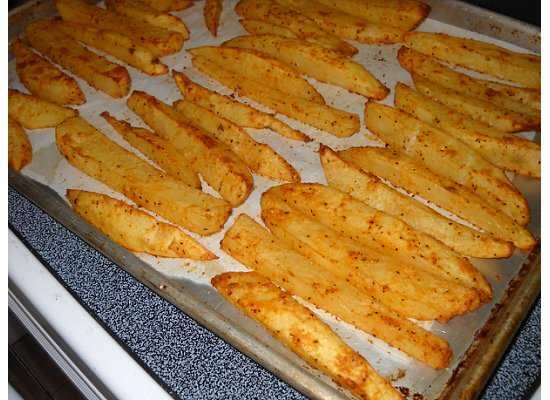 I’ve tried cooking potatoes in every form imaginable with pleasure but one form that I’ve consistently turned my nose up at is the oven baked French Fry. They either turn out so crisp that they cut the roof of your mouth or so mushy that they mimic a mashed potato. Well guess what? 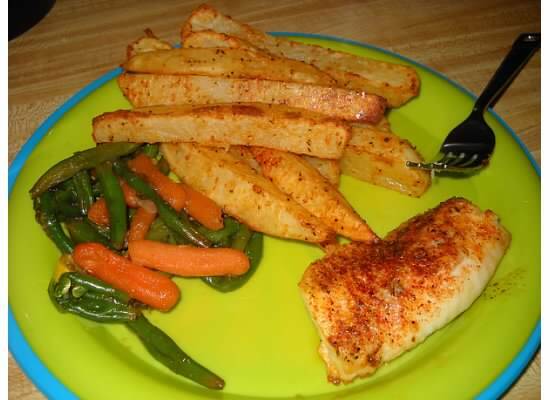 This recipe fills the bill for great tasting fries! Now spuds are a staple for the trail cook. 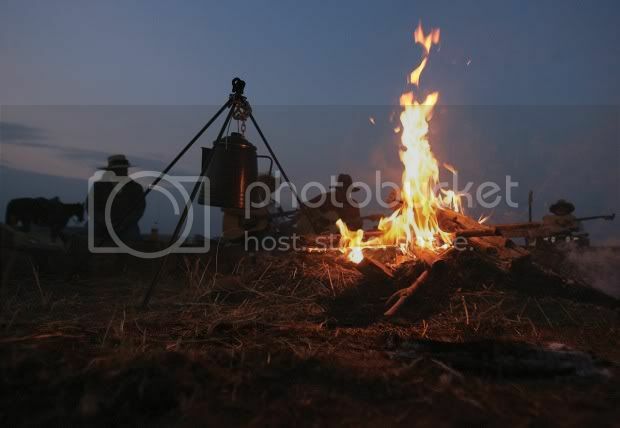 Tossed directly into a fire, home fries made in a skillet or even baked in a portable oven, potatoes can be cooked in numerous ways. But good tasting non-deep fried french fries have always been elusive… until now. Try them and see for yourself. It’s all I’m asking. 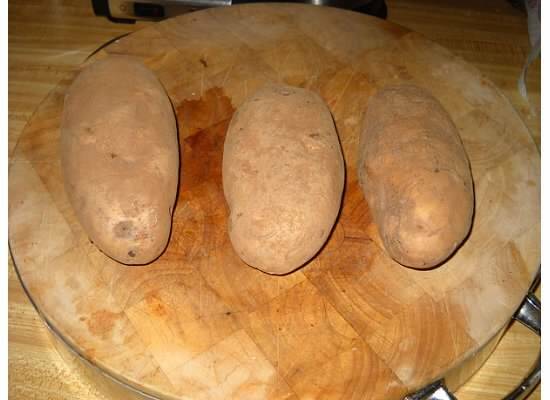 3 large russet potatoes, peeled and cut into good sized pieces. 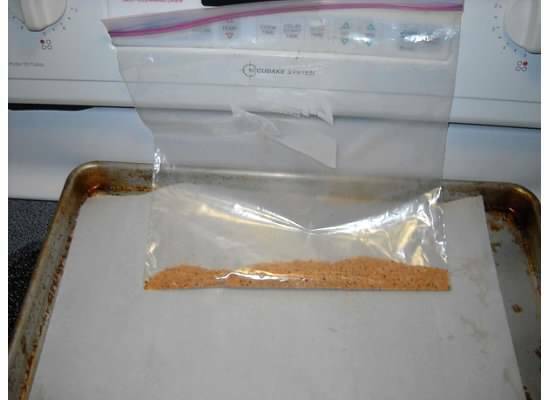 In a large plastic storage bag place all the dry ingredients in it including the Parmesan cheese, and shake it up until well mixed. 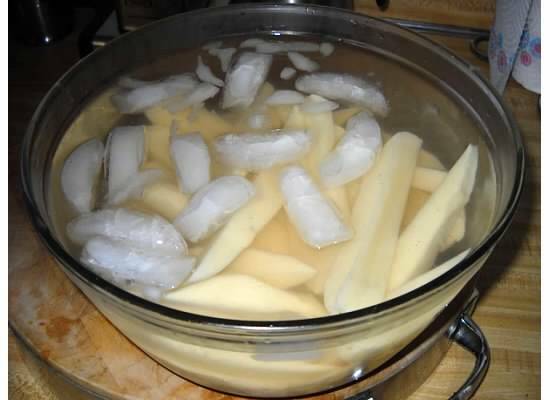 When your fries are done being chilled, drain off all the water and pour the fries out onto a cloth towel to absorb any remaining water. Give them a good rubbing to get them dry. 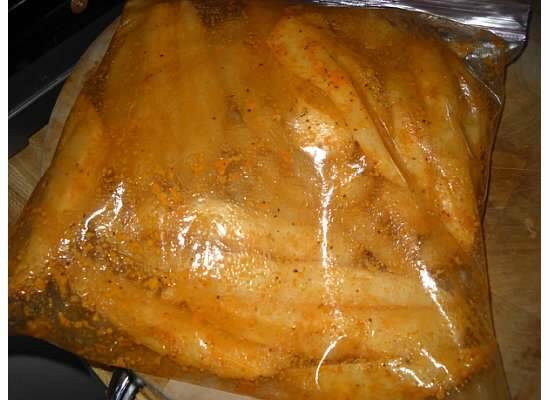 Place the chilled and now dry fries into the plastic storage bag that contains the spices and grated cheese. Do a shake and bake to get them all good and covered. 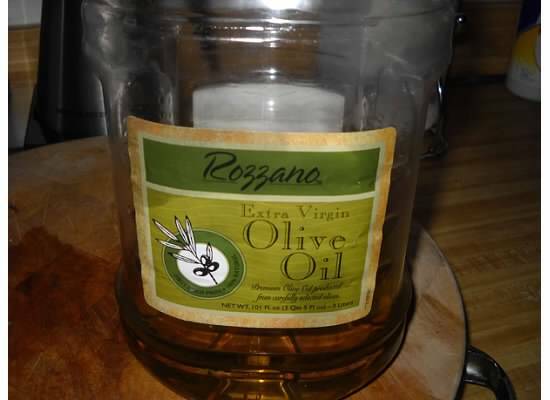 NOW, add the olive oil to the same bag and redo the shake and bake again to make sure every fry is well coated with the oil / spice mixture. 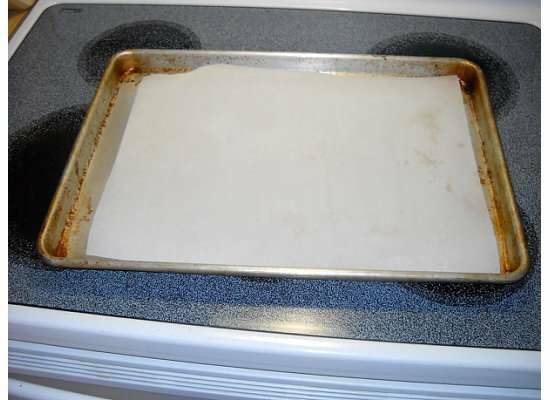 Pour the fries onto the parchment lined baking sheet and spread them out so they don’t touch each other. 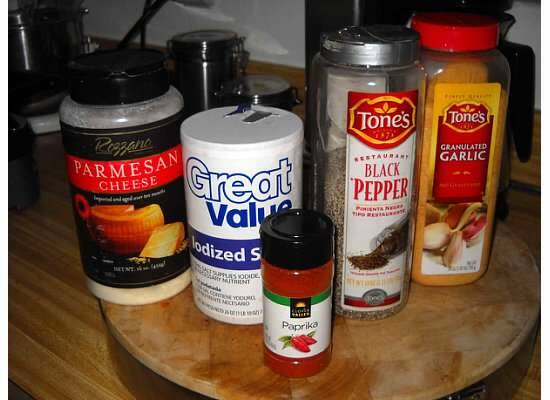 Mix up your spices and grated cheese in a gallon storage bag. 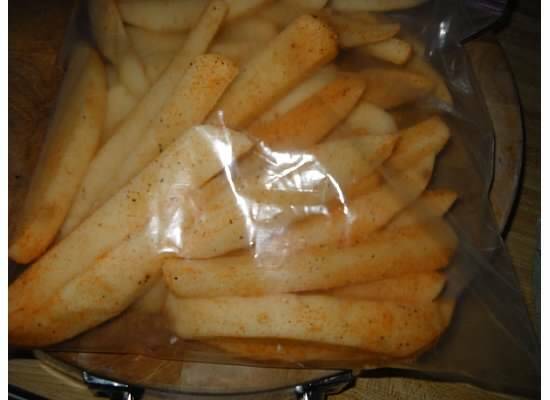 place dried but chilled fries into your spice filled storage bag and do a ‘shake and bake’ to ’em. 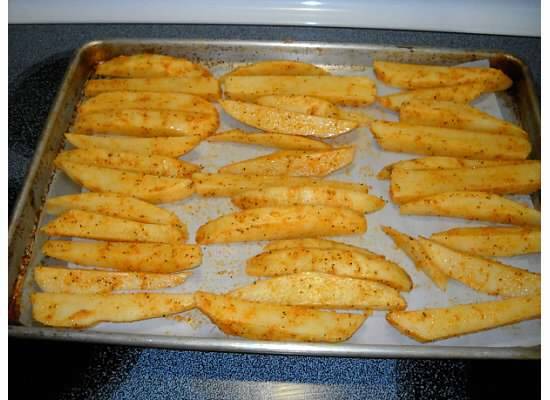 Once your fries have absorbed all the spice/oil mixture, lay them out in your pan like this. When done baking, they should look like this.